Home → Across America → Gwenyth Paltrow Dating Joey Lawrence? Rumors are flying throughout Hollywood about the secret romance that might very well have caused the breakup of Gwenyth Paltrow’s ten year marriage to Coldplay’s leading man, Chris Martin. Producer, Mildred Scalfani, who recently shot the film “Bigfoot Adirondack Stalker” which starred Joey Lawrence in the lead as a Bigfoot hunter named Slade Giuliano who goes missing after an encounter with an 8-foot tall Yeti in Saranac Lake, New York, had this to say. Some people close to the couple said that Joey Lawrence was a frequent guest at the Paltrow/Martin home and that Chris was even teaching Joey some new vocal and guitar riffs, but even then there were signs that Joey was more than just a buddy or a pal. 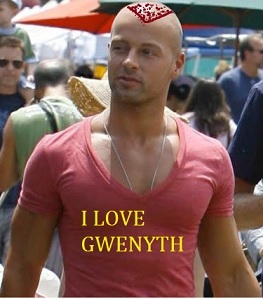 Since Gwenyth and Chris split, Gwenyth has been spotted on various Caribbean islands with Joey Lawrence who looks like he is sporting even more muscles than he ever did. “Gwenyth helped Joey through some tough times,” said Mildred Sclafani. “When Joey underwent 6 months of grueling and painful hair transplant surgeries, Gwenyth was always there to show her support. TheDamienZone.com thinks it’s funny how certain things that seem like obvious rumors often turn out to be totally true. Months ago we had reports of a love affair between Gwenyth Paltrow and Joey Lawrence but we dismissed them as silly because Gwenyth doesn’t go for guys like Joey Lawrence. She thinks she’s too good for an average celebrity – but we were wrong. We are sorry to see the Paltrow/Martin marriage break apart, but we know that there is sunshine after the rain, and who better than Joey Lawrence to bring happiness into someone’s life than Joey Lawrence especially now that he has some hair.